You can also create new rooms, using the following format, where krypted is the name of the room, the persistent option means the room is, er, persistent. The description option indicates a description used for the room. password string Define a password for room entry. An empty string implies no password required. membersOnly yes | no Only room members are allowed to enter the room. logFormat Disabled | Text | XHTML Disable room logging, or enable it using Text or XHTML. maxUsers integer; 0 for unlimited Set the maximum allowed occupants for the room. moderated yes | no Make the room "moderated". nonAnonymous yes | no If "yes", only moderators/owners can discover occupants' real JIDs. persistent yes | no Persistent rooms stay open until they are explicitly destroyed and their configuration survives service restarts, unlike non-persistent rooms. privateMessagesAllowed yes | no Whether or not occupants can exchange private messages within the room. addOwner valid JabberID Make the specified user a room owner (ex. : admin@krypted.com). Rooms can have multiple owners. Ultimately, if you’d like to do Student Information System (SIS) integration, or wait for an AD/OD group and then programmatically generate rooms, this is how you’d do it. Also, it’s worth noting that Messages (and so Jabber if you’re running your own server) is a very basic instant messaging tool. There are more modern ways of interacting with others these days, including Slack and Confluence. Additionally, the Messages app can just use the phone number of people to let address books become a way of managing groups you’d like to message. These do not require a dedicated server, but most strategies will require a monthly fee that’s typically per-user. Dropping network connections can be incredibly frustrating. And finding the source can be a challenge. 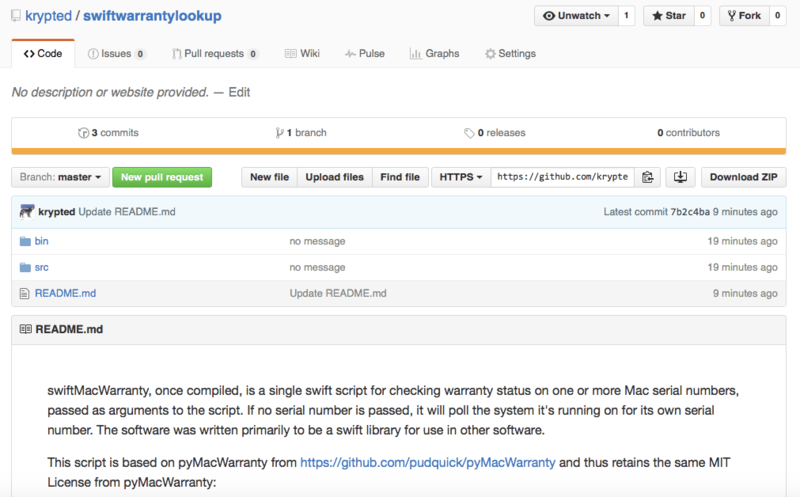 Over the years, I’ve found a number of troubleshooting methods, but the intermittent drop can be the worse to troubleshoot around. When this happens, I’ve occasionally resorted to scripting around failures, and dumping information into a log file to find the issue. For example, you may find that when a network connection fails, you have a very strong signal somewhere, or that you have a very weak signal on all networks. I’ve found there are three pretty simple commands to test joining/unjoining, and using networks (beyond the standard pings or port scans on hosts). The first is the airport command, along with –disassociate. This just unjoins all networks: sudo /System/Library/PrivateFrameworks/Apple80211.framework/Versions/A/Resources/airport --disassociate The second is a quick scan. Here, I’ve grep’d out the network I’m after (aka SSIDofNetwork – a very likely wireless network name), but when looking for environmental issues, you might choose to parse this into a csv and output all networks: sudo /System/Library/PrivateFrameworks/Apple80211.framework/Versions/A/Resources/airport -s | grep SSIDofNetwork Finally, you can join a network. You might have to escape out special characters in a password and it’s never wise to put a password into a script, etc. But, quick and dirty, this will join that SSIDofNetwork network: sudo networksetup -setairportnetwork en0 "SSIDofNetwork" mysecretpassword Anyway, loop it, invoke it however you invoke it, etc. Hope this helps someone, and if you have other tricks you’ve found helpful, feel free to throw them in the ‘ole comments! You can also secureErase a volume itself. 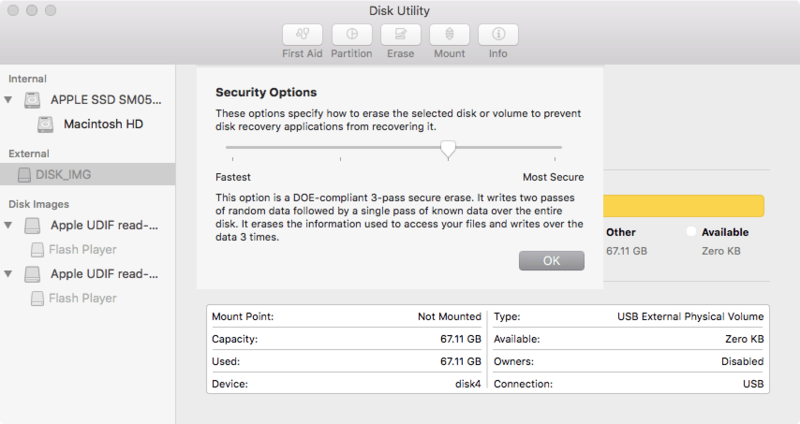 To erase a volume called /Volumes/Seldon, use the same structure of the command, but this time without the freespace option: diskutil secureErase 0 /Volumes/Seldon The latest update to Disk Utility removes a lot of options from the GUI, but overall, I have yet to find a scenario where a task I need to perform isn’t still available, if only from the command line.